While browsing the beautifully curated selection of art cards at the great Jules Besch in Truro, MA last month, my eyes were drawn to the wonderful works of Laurie Swim. 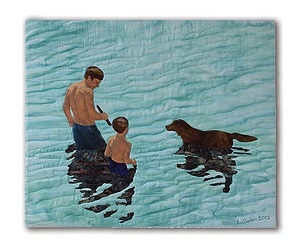 Ms. Swim’s work is wonderfully evocative of the northeastern seaside (no surprise she is from Nova Scotia) and even more remarkable as the prints I saw were taken from her medium of choice, textiles – as in quilting – and her talent is exceptional. I love her work titled “In the Moment” (above right) which is available as a note card, along with many of her other great works, in Laurie Swim’s online shop. Explore a gallery of Laurie Swim’s work here. See Laurie Swim’s online shop here. Lost Cowboy is powered by	WordPress 5.0.4 and delivered to you in 0.876 seconds using 40 queries.